Kristján Gudmundsson’s body of work seeks to lay bare the essence of art and the fundamental properties of its language. Throughout his career, Gudmundsson has taken the most basic mechanical and material elements of drawing to their limits and in the process has challenged our underlying assumptions about what a drawing actually is. In the same manner, he has dealt with the fundamental principles of painting. This particular exploration is made manifest in the Black and White Paintings in Grey and White Frames for which Gudmundsson won the 2010 Carnegie Art Award. 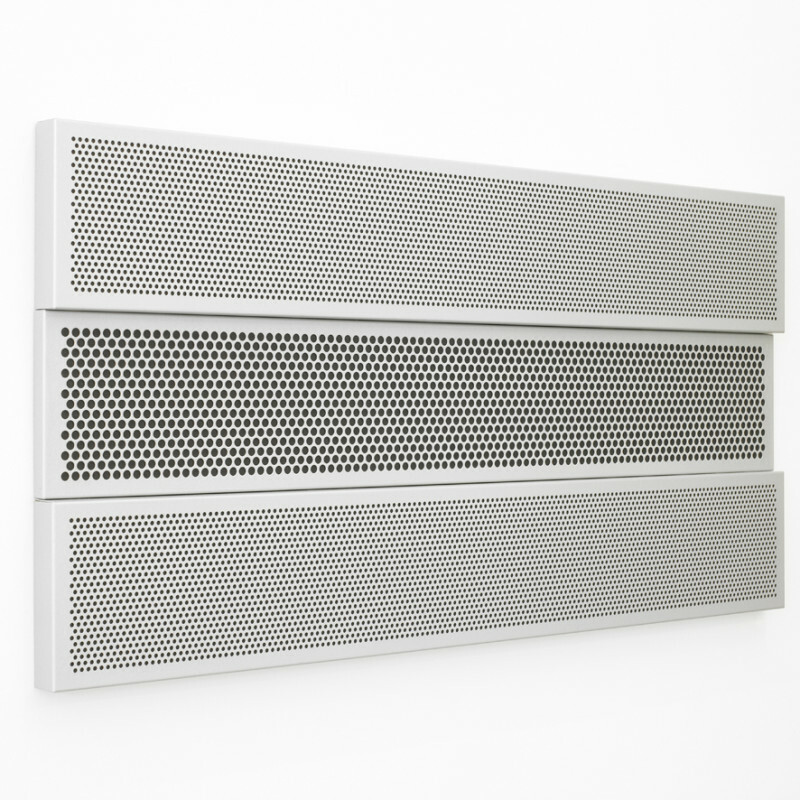 These “sound absorbing paintings” consist of black and white monochrome canvases inside custom-made perforated metal frames, (a material usually reserved for muting sound in rooms). With another sound-insulating material placed behind the painted canvases, the paintings attain a synesthetic quality as they absorb the surrounding noise. The density of the holes in the perforated metal determines the visibility of the canvas of each panel, and the latest paintings in the series, made of three panels of various thicknesses, evoke a relief or sculpture. In Security Picture, a sheet of wired glass, Gudmundsson continues to use industrial and architectural materials in an economic yet elaborate way. At the same time, he alludes to building materials with historic value. For example, the only sculpture in the exhibition, Kvíahnaus, is based on one of the four basic building units of turf used in the old Icelandic turf cottages. It is made in the exact dimensions of the traditional turf form but cast in aluminium, a material controversially associated with modern day Iceland. Thus, Gudmundsson’s work, despite its minimalistic appearance, is loaded with wit and references to cultural phenomena. Gudmundsson’s work also examines the concepts and imagery of “poetry” and literary principles of structure and process. Punktar/Periods, 1972-2011 – is a continuation of a bookwork from 1972, which had three randomly selected periods from a collection of poems by Nobel laureate Halldór Laxness. The periods, magnified at least thousand fold, formed irregular black splotches that filled each page. The new work features framed periods of cutout cardboard painted with blackboard paint. Gudmundsson originally saw the work as “poetic silences,” but it also plays with the multifarious meanings of the word “period” and like so many of Gudmundsson’s works, considers the notion of the ready-made and authorship in general.